Shaving every couple of days isn’t a huge time commitment, but when you’re chasing after 3 little boys, every bit of free time has to be used as efficiently as possible! Which is why for my birthday this year, my husband bought me my first epilator. If you don’t know what an epilator is, it’s a torture device created to bring users to the limits of their pain tolerance! Only kidding, although it can be painful, but we’ll talk more about that later. It actually is an electric hair removal device that uses several built-in sets of tweezers t o quickly remove hair and instantly leave skin smooth. Oh, and you only have to do it maybe once a month. See why I wanted one? Which Epilator Did I Get? I didn’t really know anything about epilating, so shopping for an epilator was a bit overwhelming. You had wet/dry, corded vs. cordless, $30 all the way up to $200 with multiple caps and special features. What do you pick when you have no idea what you’ll need? My solution; have my husband pick! 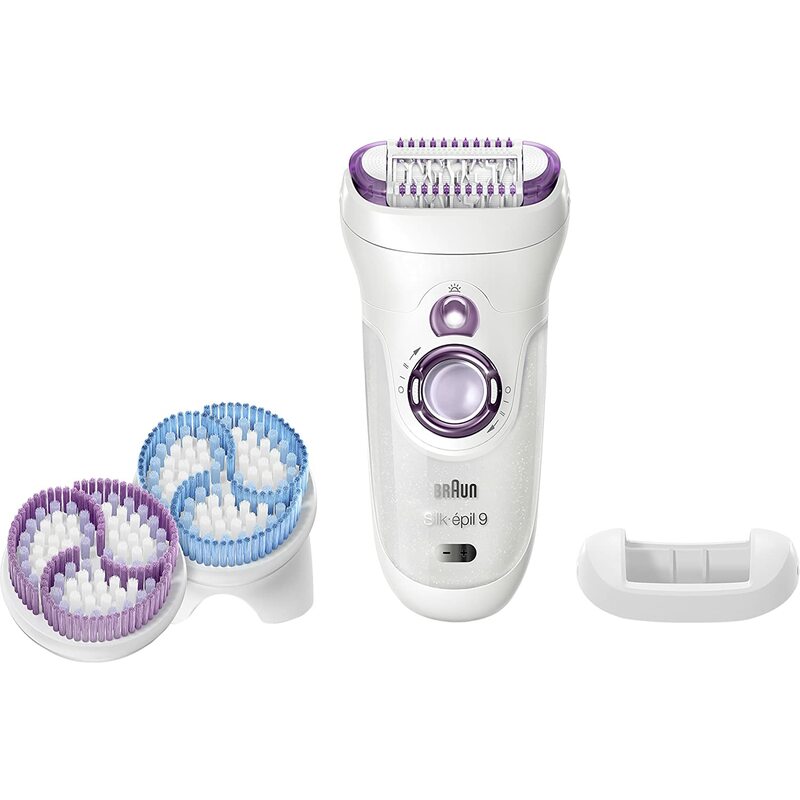 He ended up purchasing the Braun Silk-épil 9-941e Women’s Epilator and Exfoliation System. I figured it was going to hurt a bit, of course… It’s a bunch of tweezers pulling hairs out of my skin. I turned it on, even on the ‘gentle’ setting it was surprisingly loud, and immediately I froze, internally screaming, “Oh my gosh, I don’t want to do this! I don’t want to do this! This was a bad idea!” This was it.. fight or flight? (Heads up, I totally recommend this epilator!) If you’re still shopping for an epilator, check out my full review of the Braun Silk-épil 9! Against my better judgement, I placed the epilating head against my dry leg. I don’t have a lot of leg hair, but what was there was unable to stand against the force of the Braun, even on gentle mode. And yes, it hurt… A few choice words crossed my mind, but for the most part, I just chanted “Ouchie, Ouchie, Ouchie!” and turned it off after a few strokes. Did I Try Sensitive Areas? You better believe I did! It was because of areas like my underarms and bikini area that made me want an epilator in the first place. But boy, if I was nervous about putting it on my leg, I was even more anxious for these areas. I decided it was in my best interest, before attempting this area, to glace over that user’s guide. Sure enough, there was a whole section devoted epilating tips for sensitive areas. I switched out the cap on the epilator to one recommended for sensitive areas. This time, I’d try using the epilator wet, thinking perhaps it would be less painful than using it dry. I cleaned the areas, then pulled skin taut as the guide suggested, and went for it. Again, it was fairly painful at first, but as I continued, I got used to the sensation and managed to successfully epilate both of my underarms and around the bikini area. It also left the skin a bit red and irritated, but smooth. Exfolitate. If I had read over the user guide first, I would’ve known to do that. I think that if I had exfoliated prior to epilating, it would have hurt less and I probably would’ve have had less redness after. Use it Wet. I think using the epilator in the shower was better than on dry skin. Obviously, if I don’t have time to shower or just need to do a quick touch up, it’s doable dry, but I think the warm shower water beating down is relaxing and distracting to the pain. *Quick note: Not all epilators are wet/dry devices, in fact, many epilators can only be used on dry skin. So, make sure you know what you’re buying and reading the user guide before using to make sure you’re handling it properly! Is Epilating Better than Shaving? Only once a month.The fact that I only have to do it every couple of weeks is a real advantage! I already don’t feel like I have a lot of free time, so saving time skipping shaving is certainly a benefit. No more stubble or razor bumps. I would definitely recommend epilating to people who hate shaving, stubble, and razor bumps. Although my skin was red immediately after, it looked totally fine the next day, and was much smoother than any day after shaving! But I will say, it was painful. I would say that people who have a low tolerance to pain should probably stick to shaving. If you can tolerate the discomfort (which I read lessens as you use it), then epilating will absolutely leave your skin clear and smooth.